When we left off (last December! ), the internal dividers had been set on this piece and I was debating adding the external framing that’s been completed for some time. 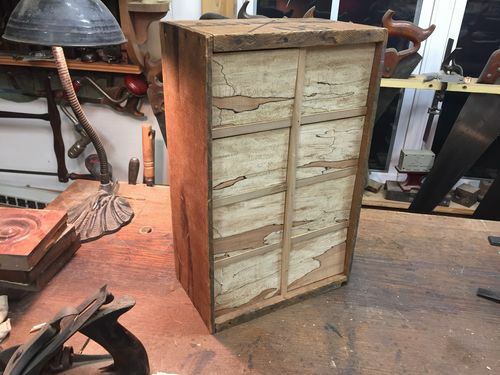 Before getting into that discussion, I’ll pass along this update: A fellow LJ (OldFart) gifted me a block of spalted maple probably 2+ years ago that I’ve been holding onto for the right project. Good News, this is the project. Here’s the block, on the far end of the bench, back in Nov 2014. 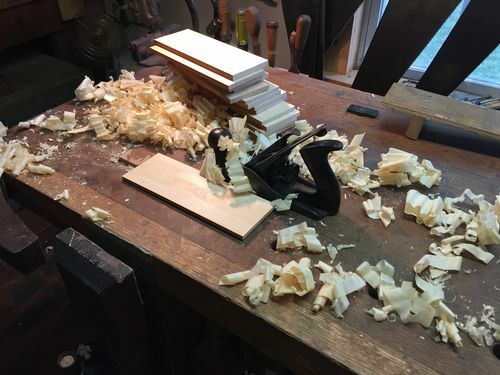 After some resewing and fiddling about, Drawer Fronts came from the maple chunk. That was in February and that’s how the cabinet (?) remained until the 4th of July holiday. What happened that brought the piece back to working status? In a word: Material. 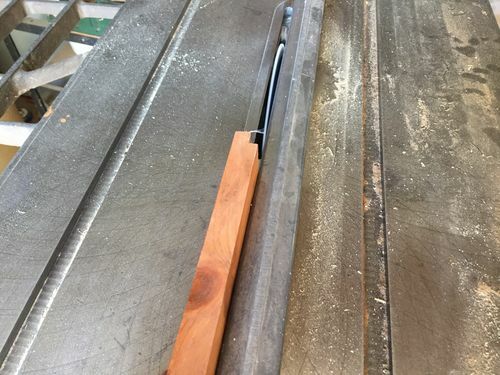 Specifically, I came across eight short (identical) pieces of pine that led to a eureka moment… they were long enough, wide enough, and when resawn would result in sixteen drawer side blanks. Perfect for eight drawers, right? Okay, game on! First, kerf cuts at the table saw. Then a pass for each board at the bandsaw. Smooth away the center waste with the venerable Stanley #4 (a workout in my uncooled shop in July!). Then a check to confirm the fronts were beefy enough to support half blind dovetails to attach sides. 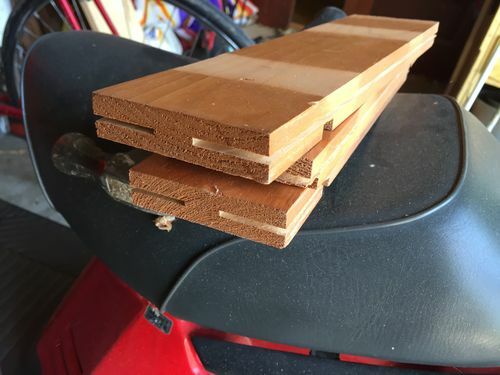 The sides aren’t perfect matches for thickness, despite my best guess at setting the fence on the table saw. No biggie, that just means marking them to fronts to ensure depth of half blinds matches each piece of side stock. 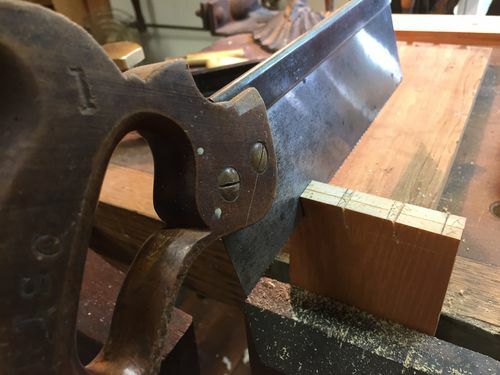 All the boards were dovetailed as a single step, and gang cutting two at a time was definitely the way to go. Oh, and the layout for the tails is done freehand by tracing both sides of a chisel in three places on the boards’ ends. 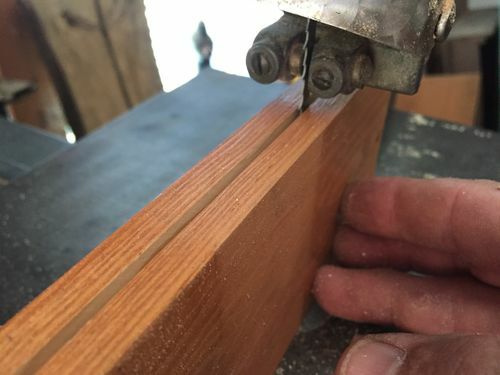 Angled cuts are whatever comes of the saw. I’ve shown pics of the process in previous blogs (that are likely useless now thanks to PHOTO ‘CHUM’ BUCKET, but that’s another story). 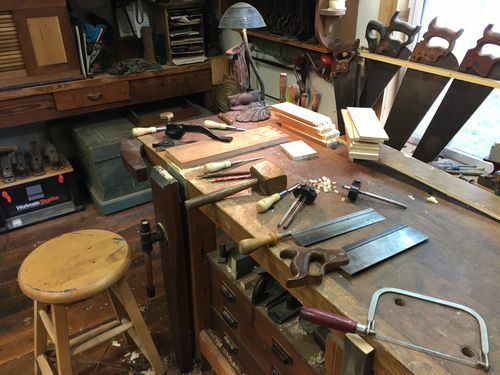 Meanwhile, here are all the tools used for dovetailing, all laid out on the benchtop. 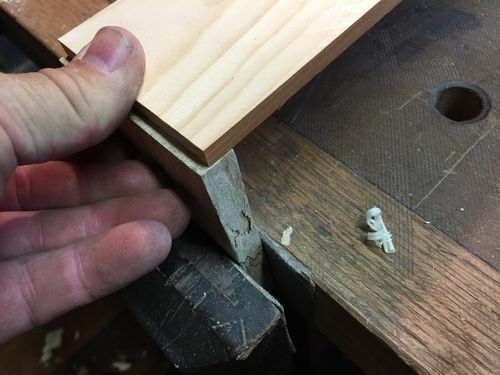 I’ve mentioned at least a few times that this kind of drawer making is one of my fave woodworking activities and it’s still true. Doing small half blinds in somewhat punky, spalted maple is it’s own kind of special activity. That said, things are about half way now on putting sides to front. 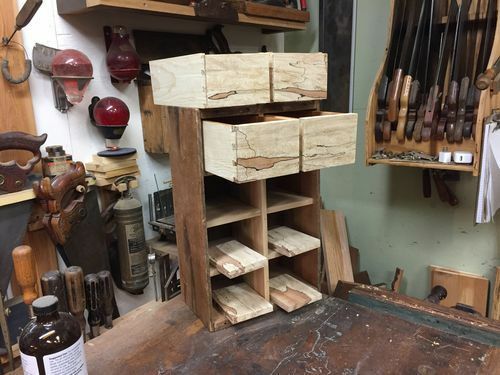 So the tasks remaining to complete drawers are apparent: four more fronts, then figure out what do do for bottoms and backs, make work that results in eight sliding drawers of the proper depth and overall fit. Gee, wonder if that will take another six months? :-) Stay tuned, and thanks for looking! That’s gonna look killer Smitty! Resawing and a bunch of half blinds in a day is solid progress for sure. 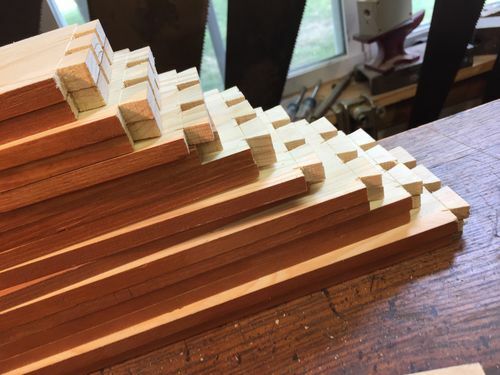 Wonderful blog and beautiful results. ...go 4th and make drawers. Thanks fellas, will ‘endeavor to persevere.’ :-) Yesterday was a good day, but a bunch of things to tackle before I get to the fun part of applying pulls and hanging it on the wall! I would assume the drawers will be sub divided? Maybe even two layers by way of trays? It does look really good. Whoa, that is looking nice? 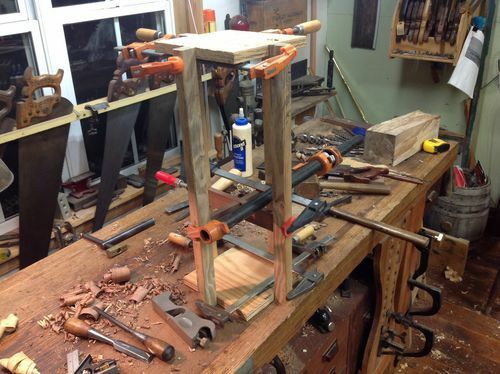 Old Fart has good wood still, lol…couldn’t resist. Just thinking of this -given the amount of work already needed to make each drawer, period- gives me a headache. The drawers are actually quite small already, something not apparent looking at the pics. Dividers would be great, sliders too, but would the added build complexity pay off in light of the hours it’d take? Shane, OF’s wood speaks for itself, I have nothing to add. I’m actually very good at dreaming up work for everyone, except me of course! I didn’t quite grasp the scale, went back and looked, I see what you mean. Carry on. That’s going to be beautiful Smitty. I love the spalted maple and it’s a gift from a friend. I have a question for you: Did you have any areas of “punkiness” that worried you structurally? I ask because I have a good bit of the stuff that looks great but I worry it is just too punky, too spongy, too far gone. In a word, Yo, yes. There was quite a bit of punky wood in the piece as I was resewing it. The good news is, most of it was addressed (re: removed) at that time. 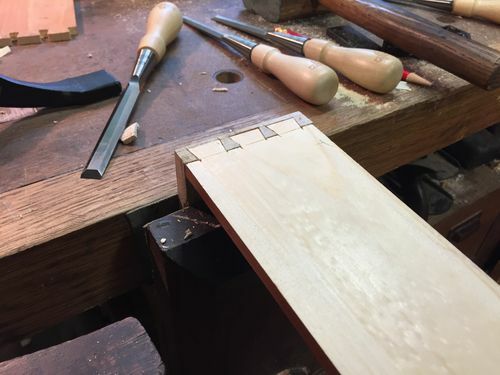 There are bits left, and that also entered into the thought process for half blinds vs. butts vs. rabbet joints for the drawer sides. 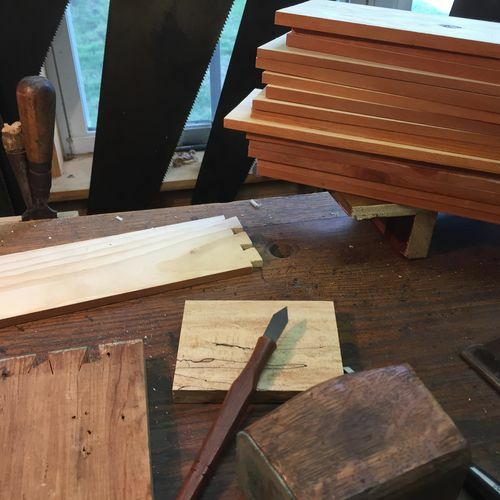 I’ve done four drawers via half blinds, or eight sides with three tails each for twenty four recesses in the maple. There have been two blowouts of punk that had to be glued back in after the chiseling was done. I don’t know if I dreamt it, read it somewhere, or actually had an original thought, but I have considered soaking the punky wood with superglue prior to processing. However, I am just not sure what this would do to blade edges. It may or may not be a good idea. Looking very fine Smitty, the contrasts between all the woods is great. Fantastic wood, really love the front. Fine work there, plenty of repetition, skills will grow and grow. Yep, it took six months to get back to this project. One-and-a-half drawer fronts done tonight, two and one half remaining before fitting, and bottoms, and hardware. At least I’m back in the shop, which is nice. It’s been a while.